Dining is one of the highlights of a cruise onboard Eurodam. Overseen by a long-standing Culinary Council, led by Master Chef and Culinary Consultant, Rudi Sodamin, and an innovative team of acclaimed chefs from around the world, the food and various dining experiences are of the utmost quality and creativity. There are plenty of free options for breakfast, lunch and dinner (as well as in-between snacks) with several for-fee restaurants providing alternative culinary options for lunch and dinner. Special dietary needs are easily met with vegan and gluten-free options available throughout the ship. The bottom line is that you will never go hungry. Dining Room (Decks 2 and 3): The two-story dining room is the heartbeat of the ship's dining. The space is elegant, comfortable and beautifully decorated with silver walls, coral red, brown and gray carpeting and coral leather seat cushions and banquettes. The backs of the chairs have a rich tapestry upholstery that is carried through on the roman shades covering the back and side windows. The floral arrangement at the entrance of both decks is stunning with an oversized vase filled with lilies and shellacked white twigs. The tables are adorned with daisy and alstroemeria floral arrangements and work well with the colors of the floral acrylic and aluminum paintings on the walls. Accent lighting is provided by two-foot-high crystal beaded wall sconces. There are plenty of two-tops, as well as square, round and oval tables for four and six. There are some larger eight- and 10-tops in the center of the dining room. The music is subdued and of a smooth jazz genre to enhance the dining experience. The friendly wait staff dress informally by day in light khaki slacks, white shirts with orange trim, gray ties and orange belts. They dress up a bit more in the evening with dark suits and formal attire on Gala Nights. All three meals are served here with breakfast being a full-service smorgasbord of every kind of breakfast food you could desire. From simple choices such as cereals, yogurts and fresh fruit to egg classics, omelets, hearty skillets, and varied waffles and pancakes off the griddle, there is plenty to choose from. They even serve up some specialties like full English breakfasts with pork banger, baked beans and mushrooms; European breakfasts of smoked fish, ham and cheese; and Asian miso soup and rice dishes. Breakfast service seemed a bit slow but it is a nice opportunity to start the day off slowly and relaxed. Lunch offers a much more streamlined menu including a small selection of starters such as bruschetta, soup or salad. Main dishes were varied with pastas, sandwiches, burgers and a choice of several hot entrees, including a vegetarian dish -- one unique option we opted for was a corn and zucchini pancake served with couscous salad that was delicious. On sea days, the dining room offers an Express Combo with a choice of two options from a list of a half-dozen items. This was handy if you had a timed event you were trying to attend. On port days, the options were even more limited: a choice of two appetizers, three entrees (Alaskan Halibut fish and chips were the special of the day during our port call in Juneau) and two desserts, so that passengers can eat and make their tour departure times. Service seemed a bit inattentive at lunch. But, due to the extensive port calls on our Alaskan itinerary, it was typically a get in, get out kind of dining experience. Dinner is a more leisurely experience. Each evening menu features recipes by one of the Culinary Council members and typically offers six or seven small-taste starters, hot and cold soups and salad choices, along with eight dinner entree choices including pasta, chicken, fish or seafood, beef, pork and vegetarian options, all served with creative sides and vegetables. The nightly menu also always offers Holland America Line Signature options including French onion soup "Les Halles," classic Caesar salad, grilled Steelhead salmon, broiled New York strip loin and turkey scaloppini. Each evening's menu also features recommended wines and eight to 10 dessert options in addition to nightly ice creams and sorbets. Gala Nights took the dining up a notch with appetizers such as jumbo shrimp cocktail, crab bisque and escargots and luxury entrees like beef tenderloin with grilled shrimp, rack of lamb and duck breast. We're still talking about the chocolate souffle with dark chocolate sauce dessert that we had. All menus feature symbols indicating vegetarian, responsible seafood, sugar free or Culinary Council dishes. You should always tell the waiter if you have any dietary requirements or allergies. Although the hours vary by itinerary and port calls, the dining room is generally open for breakfast (8 to 9:30 a.m.), lunch (noon. to 1 p.m.), two fixed seating options for dinner (5:45 and 8 p.m.) and open seating for dinner (5:15 to 9 p.m.). Be sure to consult your When & Where listing to confirm daily times. Lido Market (Deck 9): Eurodam's Lido Market is a marketplace-style buffet in a cafeteria-like setting, where passengers select items from various stations, along with several made-to-order options. The various stations include Breadboard (freshly baked bread, ready-made sandwiches and made-to-order deli-style sandwiches), Wild Harvest (a premium salad bar with dozens of ingredients that you select and are made to order in an oversized bowl -- they even offer a creative salad of the day suggestion), Homestead (hot comfort foods such as scrambled eggs and pancakes for breakfast and meatloaf, roasted chicken and a freshly carved roasted meat of the day for lunch and dinner), Distant Lands (featuring the Asian corner with varied Asian cuisines daily, an Italian buffet with changing pasta shapes and sauces made-to-order, and a Mexican buffet with made-to-order tacos and burritos with all the fixings), Market Central (cheeses, fruits and varied prepared salads) and Sweet Spot Bakery & Creamery (sweets, baked goods and ice cream). The Lido Market is made up of two cafeteria-style lines back-to-back with the varied stations on each side. In between and perpendicular to the lines are 24-hour coffee and beverage stations with coffee, tea, water, juices and iced tea. The decor is open and airy with blond wood tables and yellow and green leather chairs all on a green, blue, yellow and purple striped carpet. They add a nice touch with live orchids on every table. There are plenty of tables along both sides of the Lido Market with expansive windows to watch the world go by. There is also alfresco dining aft near the Sea View pool or midship around the Lido pool. The food is quite good when you consider how much and how often food is being served in the Lido Market. Because of health and cleanliness concerns, passengers are not allowed to serve themselves any food, other than the Market Central salads, desserts and beverages. Because of that, there are occasional waits. On port days when most of the shore excursions are leaving around the same time, it can be a bit congested at breakfast. But we didn't find it too bothersome and passengers were generally quick with their selections. The Lido Market is open from 6 to 10 a.m. for breakfast; 11:30 a.m. to 2 p.m. for lunch; 2 to 4:30 p.m. for late lunch at select stations; 5:30 to 8:30 p.m. for dinner and 10:30 to 11:30 p.m. for snacks at select stations. Dive-In (Deck 9): Situated in the Lido pool area and just outside of the Lido Market, Dive-In serves three versions of grilled burgers, a grilled portabella mushroom sandwich, a grilled chicken sandwich, three varieties of hot dogs and fries -- naked, topped with Dive-In sauce or smothered in cheese sauce. Open 11:30 a.m. to 5:30 p.m.
New York Pizza (Deck 9): Located near the Sea View pool aft, the pizzas are made-to-order with varied set combinations or you can pick your own ingredients. The thin-crust pies come out piping hot in individual-sized portions and can be paired with salads and desserts. Open 11:30 a.m. to 11:30 p.m.
Explorations Cafe (Deck 11): Sharing space with the Crow's Nest all the way forward, Explorations Cafe offers light snacks throughout the day including fruit cups, yogurts and pastries in the morning, finger sandwiches and cookies midday and sweets in the evening. Afternoon Tea (Deck 3): Served most afternoons in the Ocean Bar, afternoon tea offers a variety of teas, finger sandwiches such as prosciutto and fig and cucumber and boiled egg, pastries, scones and a variety of sweets such as profiteroles, tiramisu and fruit tartlets. Room Service: Complimentary in-cabin dining is available around the clock. On offer are a breakfast menu (6 to 11 a.m.), an all-day menu (11 a.m. to 11 p.m.), a late-night menu (11 p.m. to 6 a.m.) and a kid's menu (5:30 to 9:30 p.m.). Pinnacle Grill (Deck 2, midship); $10 lunch/$35 dinner: A Holland America staple, this restaurant is all about refinement and luxury. With a nod to Holland America's Seattle home base, this classic steakhouse and grill serves up Pacific Northwest cuisine in an intimate and elegant dining room with rich, plush decor and attentive and professional service. Serving lunch on port days and dinner every night, the menu is luxurious. It begins with an amuse-bouche at dinner that awakens your palate. There are nine lovely starters to choose from such as lobster bisque, jumbo shrimp cocktail, crab cakes and even Osetra Malossol caviar (with a $70 supplement). There are also some vegetarian options such as a spinach arugula salad and a beefsteak tomato and basil starter. The mains are broken into Land and Sea. Steaks are the specialty and there are six cuts to choose from. They all come with a choice of six sauces (our favorite was the maitre d' garlic butter) and eight traditional sides like creamed spinach, sauteed mushrooms and the can't-miss shoestring fries with truffle aioli. If steak isn't your thing, there are plenty of other options on the Land menu, including a double-cut pork chop or wild mushroom risotto. We had a tough time passing on the grilled Colorado lamb chops and we're glad we didn't -- it was delicious. You also can't go wrong with the Pacific Northwest sea options like Alaskan king salmon, cedar planked halibut with shrimp scampi and seafood cioppino. Cap off the meal with one of their decadent desserts like the Not-So-Classic Baked Alaska (made with Ben & Jerry's Cherry Garcia ice cream), Grand Marnier Chocolate Volcano Cake or an international cheese platter. They also have an extensive port, dessert wine and brandy list. At a reasonable $10 for lunch (slightly pared down menu) and $35 for dinner, a meal here is truly an indulgent and memorable experience and should be enjoyed at least once during a sailing. Be sure to call ahead for reservations. 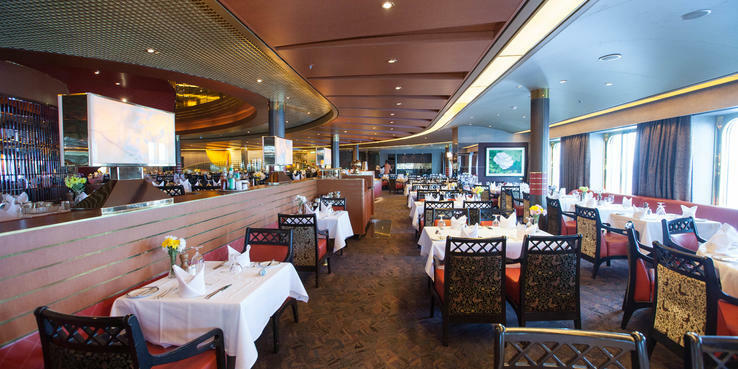 Sel de Mer (Deck 2, midship); $35: The Pinnacle Grill also plays host to the occasional pop-up restaurant. On Eurodam, that is an evening at Sel de Mer, an intimate seafood brasserie. With a contemporary twist on French seafood classics such as escargots bourguignonne, bouillabaisse and salt-crusted whole fish, you will truly feel like you've arrived in France. If seafood isn't your thing, they have plenty for the landlubber including steak tartare, foie gras torchon, duck cassoulet and souffle au fromage. At $35 per person and only available once during a seven-night cruise, it's a wonderful evening and worth the splurge. Canaletto (Deck 9, midship); $15: At night a corner of the Lido Market becomes Canaletto, a popular Holland America staple that features an Italian sharing menu for a reasonable price. Start with a couple of small plates like antipasto, zuppa di pesce or mozzarella di bufala. Pick a pasta from spaghetti, ravioli or gnocchi. Then share a large plate of veal tenderloin, braised chicken cacciatore or grilled sea bass. There are vegetarian options in each category. Finish your meal by sharing a tiramisu, cannoli or gelato. The food is delicious (this was one of our favorite menus onboard) and the service is attentive. They even offer an Italian-only wine list. The one negative is that it's located in a corner of the Lido Market. And although the views are stunning, you are still in the highly trafficked buffet area. So, you hear the din of people passing through, having dinner and even coming in from the adjacent pool in their bathing suits. Making a reservation is suggested and going later in the evening helps with the noise and traffic control. Tamarind (Deck 11, midship); $25: This was, hands down, our favorite specialty restaurant on Eurodam. Serving dinner only and representing the culinary traditions of Southeast Asia, China and Japan, the Pan-Asian menu features dishes honoring the elements of water, wood, fire and earth. The decor is Asian-themed with muted bamboo-inspired lighting and Asian artwork. Table settings are also Asian-themed with bamboo-like place mats, chopsticks and chopstick holders. One of our favorite things about Tamarind was sharing starters and sushi with the table (as is often the case with Asian restaurants, the more the merrier). Some of our favorite starters included the satay sampler, shrimp tempura Indochine, Peking duck with crepes, and crispy vegetable spring rolls (vegetarian option). They feature a nice selection of sushi, nigari and sashimi as well as sushi and specialty rolls that are also great for sharing. There are three entree options in each category: Water (sea bass, lobster or barramundi), Fire (Sichuan shrimp, red curry chicken, and Vietnamese-style lamb), Wood (beef tenderloin, pork belly or duck breast) and Earth (three vegetarian options including vegetable massaman, sesame udon noodles and sweet and sour vegetable tempura). Try the Tamarind Chocolate or Mango Cloud for dessert. There is also a sushi bar with seating if you just want to come in for an evening appetizer before heading elsewhere for dinner. As with all the specialty restaurants, reservations are suggested. Room Service: Varied items from some of the specialty restaurants can be ordered as well and carry a delivery charge: Bento boxes from Tamarind are $9.75 per item; burgers, sandwiches and hot dogs from Dive-In are $4.95 per item; and steak or lobster tail from Pinnacle Grill, are $15 per steak and $20 per lobster tail.